I was massively impressed by the way your team went about the pool at Simor House. Having been around in the business for 40 years, I’ve seen a lot of good and bad - and Falcon Pools on this project were right up there. All the essentials; organisation, quality, communication. A pleasure to work with you. Thank you for all your help and service, over the past 24 years and I hope we will be able to use you again when we purchase our new home. Thank you so so much for all your help over the last couple of days. You have all been absolute stars and I couldn't have done it without you. We have had a great relationship with Falcon Pools over the last 20 odd years (god I feel so old) and I am just sad it is all over. Give Andy a big hug from me and I shall miss hearing about how his family are doing. Can you please thank Phil and the others for all their help too. A big, big thank you for all your help throughout the whole extended process of refurbishing our pool. Apologies for dragging my heels but I am SO pleased with the end product. My first swim was wonderful - the ease of using the cover, the colour of the tiles, the freshness of the water, I was in seventh heaven! I would like to think I can be like the 90 year old, who Keven was telling me about yesterday, and will swim all year round in an unheated pool but that ain't going to happen. I will be turning up the heat a notch this morning as 78 degrees was a tad bracing.Thank you all again, especially to Kevin for remaining so patient throughout! Thank you very much for taking care of the pool repair while we were away on holiday. My heart sank when I discovered on the day we were leaving that there was a leak somewhere. I was particularly worried about turning off the plant as it was still very cold when we left. It was very reassuring when I spoke to you, when I arrived in Argentina, to be told you would take care of it. As you gathered, we were really in the wilds – no text or phone and very limited emails. So knowing you would look after it all was a big relief. The pool is now refilled and it is all fine. I would like to take this opportunity to thank you for the excellent pool service maintenance that you have provided over the last 8 years and will highly recommend you to the new owners of the property. Just wanted to compliment Phil and to pass thanks on to your team at Falcon Pools who have been very professional and very tidy! Thanks to all at Falcon Pools, we are delighted with our new pool and had the perfect first weekend for it. Much appreciated. I would like to take this opportunity to extend a big thank to everyone at Falcon Pools for the wonderful service that has been provided over almost 20 years in maintaining our pool. Thank you for all the kind assistance that has always been given to me over the years when dealing with any matter relating to our pool. It has been greatly appreciated. I shall miss you all. Would you please pass on my very grateful thanks to Phil and the team for pulling out the stops in regards to trying to repair the pool cover/motor that had packed up at our home.... From day one Falcon have provided an outstanding personal service, which is very much appreciated. Thank you all for your hard work getting our pool up and running again with the replacement slats, sorting out the motor and steam room. Many thanks to Sue and Paul for all of the great service they give us. We would like to say a 'huge' thank- you to the team at Falcon Pools namely Elliot, Derek, Phil, Peter, Martin, Darren and Ian for the brilliant job on the refurbishment of our indoor pool here in Woodham. What seemed an overwhelming job with new liner, floor, ceilings, humidifier and boiler updating was made very interesting and exciting by the team. Ian your advice and patience with us was both was very helpful and supportive from start to finish. The pool looks brand new and we have been in it none stop. So thank you all once again for a very professional job. Just wanted to let you know that all the guys that have attended to our school pool have been brilliant, very polite and most helpful, a true credit to your company. We are all well and excited to use our new pool! I just want to say how fabulous all the guys have been with a special mention to Elliot and Darren - they are so trustworthy, polite, honest workers, always here on time and fabulous at what they do, so a huge thank you to them! I wish to thank the staff at Falcon Pools. We have found the service both from the onsite technicians and from your office very helpful, friendly and efficient. A pool of our own had always been a dream, but Falcon Pools made it a reality that was better than we could have ever dreamed of. Thank you. Perhaps I can take this opportunity to say how impressed I was with your workforce. They were all very pleasant, courteous and hard working, and justified my faith in Falcon Pools. Please thank them on my behalf. Thank you for your help and assistance with numerous pools installed for Octagon and I hope to be able to keep you equally busy in the New Year. The pool at Littlewood in East Drive, Wentworth is in my opinion the best indoor pool in a private house that we have constructed to date and I look forward to numerous more excellent pool installations by Falcon in the coming years. 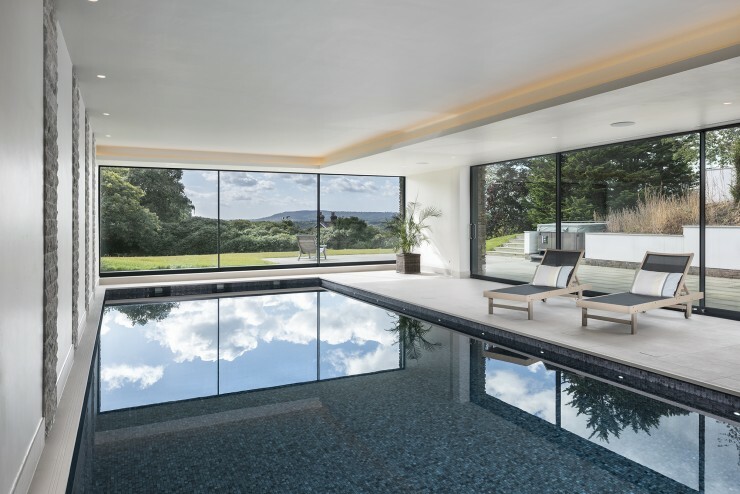 At Chartridge we design and build prestigous, luxury family homes and we only work with people who meet our stringent standards. We’ve worked with Falcon Pools for the last five years and they are always efficient and competitive. Their experienced staff and hands-on directors provide comprehensive, all-inclusive service right through the process, from intial designs to completion and maintenance. Their staff also tend to stay with the company for a long time, which means we’ve been able to develop good relationships with the team. From personal experience I would be amazed if you could find a better pool installer in the UK. Their website is a true reflection of their market presence, diversity and creative ingenuity. Their knowledge and ability to deliver at every level is patently obvious and refreshingly effortless. Falcon Pools are, in my opinion, consummate professionals from start to finish. Falcon Pools are a well-established and award winning swimming pool construction company based in Surrey but servicing Middlesex, Berkshire and the south of the UK. Offering unique outdoor and indoor swimming pools, beautifully designed. Call us now on 01932 353040 to arrange a consultation.